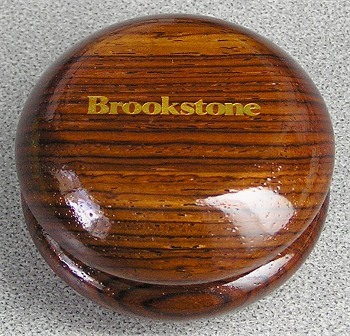 Of all the exotic wood yo-yos made by Hummingbird, the one made for Brookstone is perhaps the most beautiful. Natural Cocobolo with a high gloss clear finish. Very beautiful. This was a custom design for Brookstone and appeared in their catalog, and at their stores for years. An executive yo-yo, with the Brookstone logo front and back. A Very heavy yo-yo, as cocobolo is a very dense exotic wood.